Cleveland's Memorial Shoreway (I-90) bisects Gordon Park near the mouth of Doan Brook. To the north of the Cleveland Metroparks Lakefront Reservation field office on Lakeshore Boulevard lies Dike 14, now known as the Cleveland Lakefront Nature Preserve. The space is officially designated as "a confined disposal facility," or CDF, for dredge spoils. Dredging involves removing sediments that build up on the bottom of a riverbed to maintain a navigable channel. Prior to the Clean Water Act of 1972 the dredge spoils from the Cuyahoga River were put in the open lake or along the shoreline to create new land. 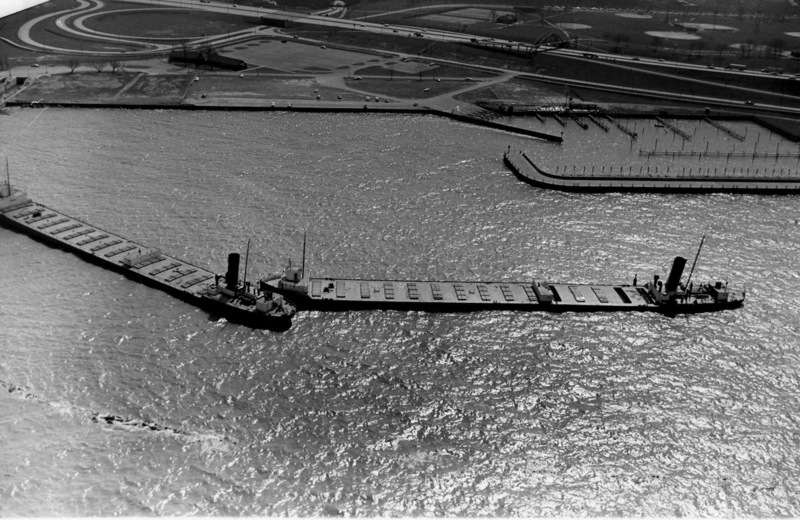 Between 1979 and 1999, the US Army Corps of Engineers, under contract with the Cuyahoga County Port Authority and the City of Cleveland, filled the space with dredging material from the Cuyahoga River. Dike 14 stands 39 feet high, has a 5,400-foot perimeter, and occupies 88 acres. It is one of a series of confined disposal facilities in Lake Erie along Cleveland's shoreline, but it is no ordinary CDF. Since 1999, Dike 14 has been naturally reforesting. During the first half of the twentieth century, the city used much of the area just east of Gordon Park as a garbage dump. 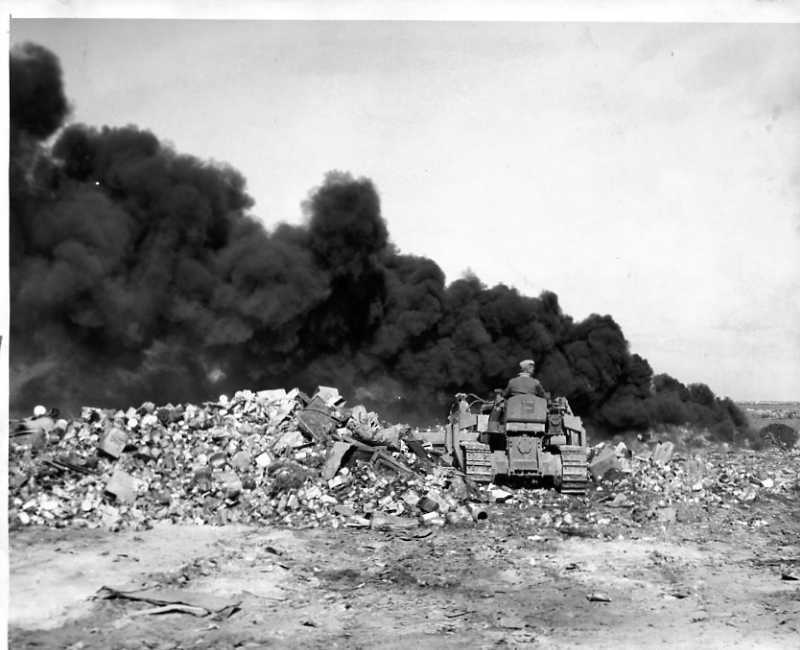 As many as 1,000 trucks brought their tattered loads of rubbish to the dump each day for incineration. At the same time, industrial wastes were routinely secreted into the Cuyahoga River, adding to its demise and ultimate 'death'. The accumulation of years of pollutants branded the river the most polluted river in the United States. The river required cleanup, including removal of sediment from its bed. The eastward extension of the Memorial Shoreway in the 1950s divided Gordon Park. The park fell into neglect and adjacent land became used as a landfill by the city. In 1962, two sixty-year-old freighters, the James S. Hill and the William Edenborn of the U.S. Steel fleet, were sunk offshore to protect against beach erosion. In 1965 the city announced plans to utilize the site for a landfill to expand the park. Two years later the city began to dump junked cars and other refuse at the site. 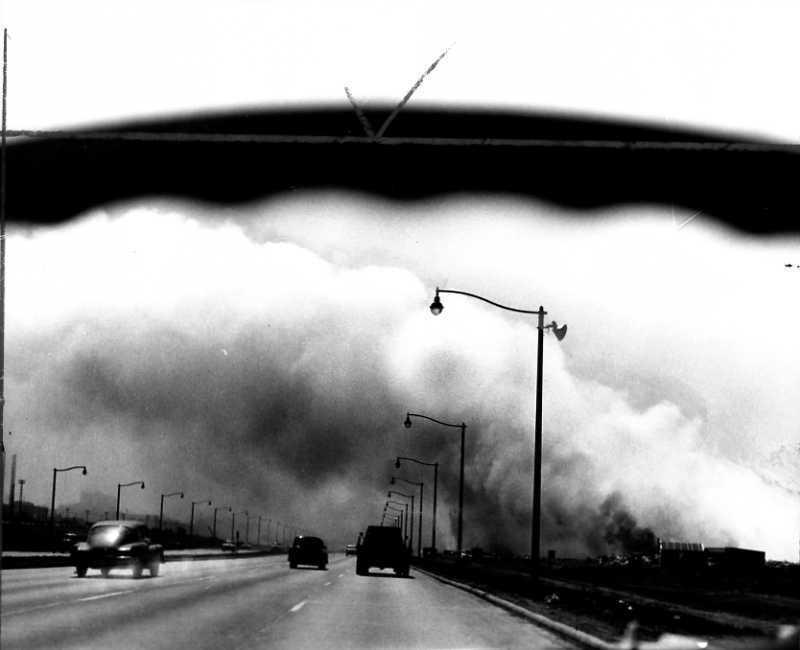 By March 1969, the Cleveland Press reported that more than 8,000 cars along with other rubble had been dumped at the landfill. However, the city was criticized for its poor handling of the site allowing pollutants to escape into the lake. On May 18, 1971, the Cleveland Press reported that the planned fishing pier would likely "remain a crooked finger of barren land in the lake." Meanwhile, several organizations and agencies were seeking efficient, effective, and environmentally safe solutions to urban industrial challenges. In 1975, a proposal by the U.S. Army Corps of Engineers drafted a plan to utilize the landfill space adjacent to Gordon Park as "Diked disposal facility site number 14." The report detailed a plan to construct a retaining wall around the space that contains the freighters, junk, and fill (about eight acres) and enlarge the walled space in the lake to include another 80 acres to deposit river dredged material in a safe manner that would not threaten the lake with its pollutants. The proposal was approved with little opposition, except from the neighboring Bratenahl City Council. In 1979, work began on a breakwall, a retaining culvert for Doan Brook, and rubble mound walls for the dike. The final fill occurred in 1999, twenty years after filling began. Dike 14 presently holds about 5.66 million cubic yards of consolidated dredge material. All of the vegetation and wildlife now present has occurred naturally, including more than 280 species of birds and several varieties of butterflies. Revitalization of the area occurred after the last fill deposit without human intervention (planting, seeding, or stocking). However, some grooming activity has enhanced the site for birding walks. Dike 14 is held under public trust by the State of Ohio, and is currently under lease to Cleveland-Cuyahoga County Port Authority. 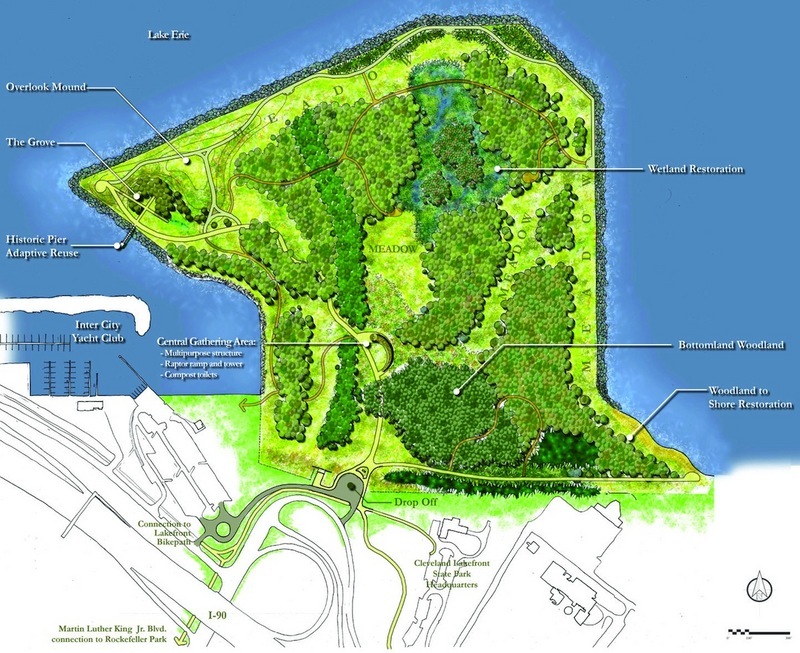 The Cleveland Lakefront Nature Preserve formally opened to the public on a daily basis in February 2012. 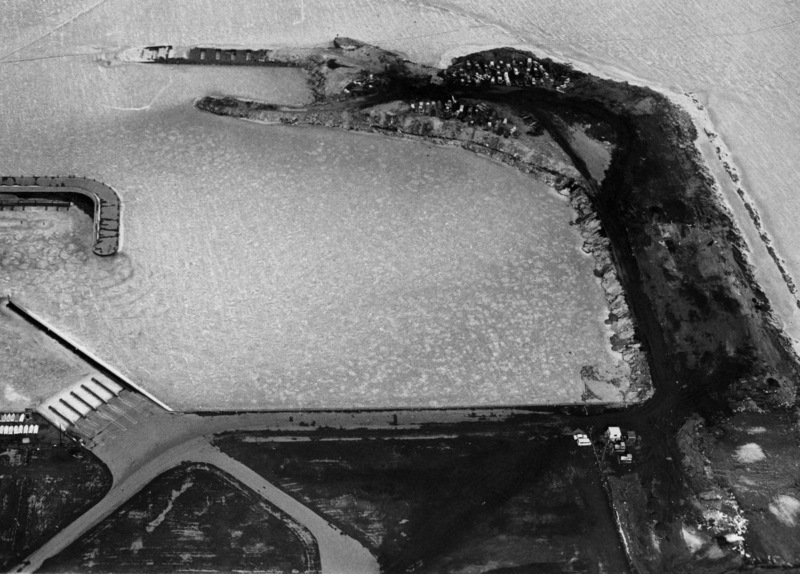 The Gordon Park Landfill, 1957: Gordon Park shoreline space, north of the highway, was used as a landfill ostensibly to protect the beach from erosion. Image courtesy of Cleveland State University Michael Schwartz Library Special Collections, The Cleveland Press Collection. 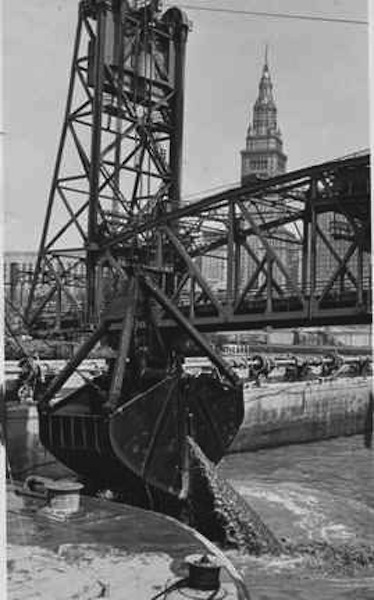 Dredging the Cuyahoga, 1954: The U.S. Army Corps of Engineers was contracted by the Cleveland Port Authority to dredge the Cuyahoga river to maintain shipping clearance. Annual dredging has helped keep the river open to large ships for over a century. Image courtesy of Cleveland State University Michael Schwartz Library Special Collections, the Cleveland Press Collection. 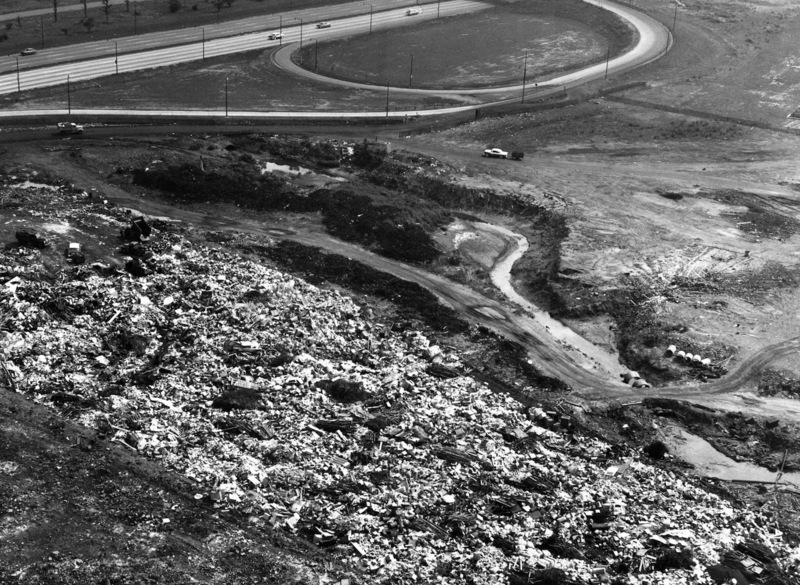 Gordon Park Landfill, 1968: The initial landfill at Gordon Park included junked cars and other toxic wastes. The Corps of Engineers planned to contain the site with retaining walls before filling the area with the river dredge spoils. Image courtesy of Cleveland State University Michael Schwartz Library Special Collections, the Cleveland Press Collection. Sunken Freighters, 1963: Two 500 foot freighters were sunk off the shore near Gordon Park. The grounded ships provided a foundation for the breakwall to protect a boat launch facility. They are now the western "hook" of the nature preserve. Image courtesy of Cleveland State University Michael Schwartz Library Special Collections, the Cleveland Press Collection. 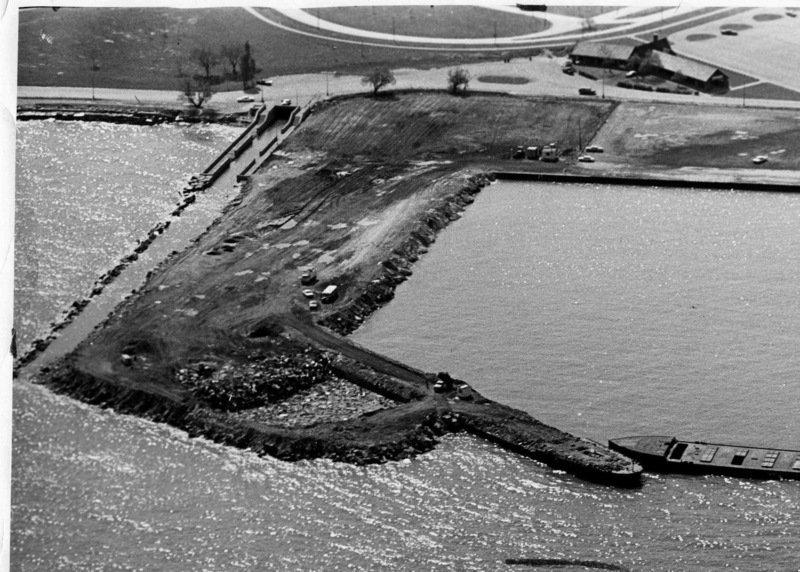 Gordon Park Landfill, 1969: Six years after the placement of the sunken freighters, the landfill is starting to take shape. Image courtesy of Cleveland State University Michael Schwartz Library Special Collections, the Cleveland Press Collection. Driving Towards Downtown: Smog from the lakefront dump fires clouded the air for motorists heading into downtown Cleveland from the east Shoreway. Image courtesy of Cleveland State University Michael Schwartz Library Special Collections, the Cleveland Press Collection. Cleveland Lakefront Dump, 1957: The City of Cleveland used lakeshore spaces between East 9th Street and Gordon Park (East 72nd Street) for landfill and refuse dumping and burning between 1900 and 2000. Over the years, several measures were enforced to utilize cleaner and safer landfill strategies. Image courtesy of Cleveland State University Michael Schwartz Library Special Collections, The Cleveland Press Collection. Dike 14 Master Plan, 2005: The City of Cleveland Planning Commission initiated the plan to utilize the Dike 14 confined disposal facility as a nature preserve. The idea came about as the site began regenerating plant wild life once dumping ceased in 1999. Subsequent air and soil tests deemed the space safe for recreational use. 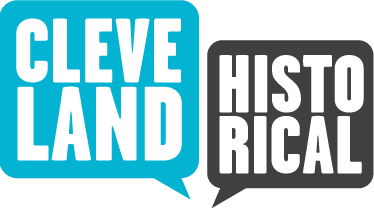 Image courtesy of the City of Cleveland Department of Parks, Recreation, and Properties. Cleveland Lakefront Nature Preserve : Today, the 88 acres of Dike 14 are home to rich and naturally occurring vegetation, as well as to several species of birds and other wildlife. Soil testing has also verified the conditions at Cleveland Lakefront Nature Preserve to be environmentally safe. Image courtesy of The Cleveland Plain Dealer. Jim Lanese, “Dike 14,” Cleveland Historical, accessed April 19, 2019, https://clevelandhistorical.org/items/show/433. Published on Apr 24, 2012. Last updated on Apr 18, 2017.